Originally laid down near Memphis, TN in October 1861, CSS Arkansas was supposed to be delivered to the Confederate Navy three months later. By the time she actually entered service on 12 July 1862, the Union Navy controlled much of the Mississippi. 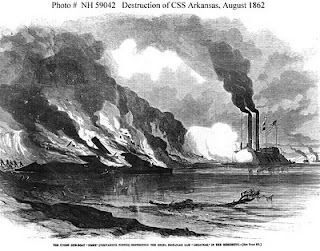 Arkansas saw combat immediately, engaging Union ships three times on 14 July as she made the dash from the Yazoo River to the city of Vicksburg, Mississippi, then under seige by Union naval forces. Her presence at Vicksburg forced the Union ships to keep up steam constantly (rather than remaining at anchor and being vulnerable to attack) and this drain on their resources eventually forced them to withdraw, breaking the siege. The ironclad's short career ended when she set forth from Vicksburg to support a Confederate attack on Baton Rouge, Louisiana. On 06 August, 1862, her engines failed during an engagement with the Union ironclad Essex. She ran aground and was intentionally burned to prevent her capture. She currently rests under a large rock levee on the west bank of the Mississippi River. It is likely that no artifacts will ever be recovered from the site. In 21 days, CSS Arkansas was in five battles with Union ships. She badly damaged many of her opponents and established a fearsome reputation during her short career. More information about CSS Arkansas can be found on the U.S. Naval History and Heritage Command website, or by visiting our exhibit "We Fought Them" at the museum, which will run through the fall. Image courtesy of the U. S. Navy History and Heritage Command, Washington Navy Yard, Washington, DC.